And now for my least favorite topic: Fluid heads and quick release (QR) plates. There are two types of fluid heads that I use (and please forgive me for not using the technical terms – I don’t know them!) – a half ball mount and a regular threaded mount. The half ball mount has a post that extends through the bottom of the tripod and allows for “joystick” leveling and adjusting of the head. 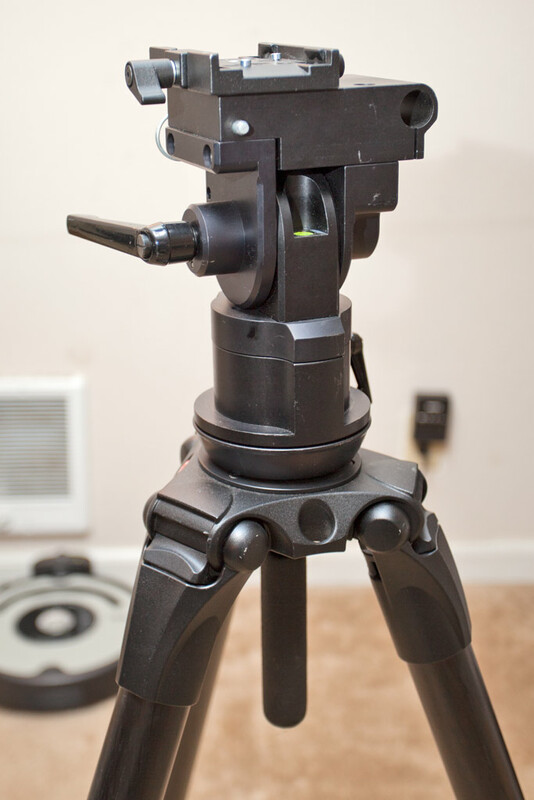 The regular threaded mount is flat on the bottom and all of the leveling and head adjustments come from the tripod leg length and actual head. The photo to the right (Manfrotto 504HD Fluid Video Head) is an example of the half ball mount. If you look closely (click the image to view larger) you’ll see the post extending below the head. A quick release plate is how you attach your camera to the head. There are several different types, sizes and mounts of quick release plates and it’s definitely worth your while to spend a little extra to get compatible plates. I’ll talk about this in more detail below. While tons of quick release plates are not strictly necessary you’ll find that they save you a lot of time and irritation in the field. I have enough QR plates that I can keep them screwed into all of my gear, all of the time, plus about four extra (more on that below). If you’re on a budget skimp here but know that you’ll need to keep a screwdriver in your kit (which you should anyway, along with a set of hex key/allen wrenches) and you’ll be spending some time swapping out plates while on your shoot. Manfrotto 501 HDV (apparently this has been discontinued) - The cheaper version of this head (which IS still available) is the 701 HDV. This fluid head comes with a fixed length arm but I’ve removed it for easier use and transport. The 501 HDV (and 701 HDV) fluid head is an example of what I’m calling a regular threaded mount. See how the bottom of the fluid head is flat? You just screw the entire head onto whatever mount you’re using – in this case I have it attached to the carriage of my slider. 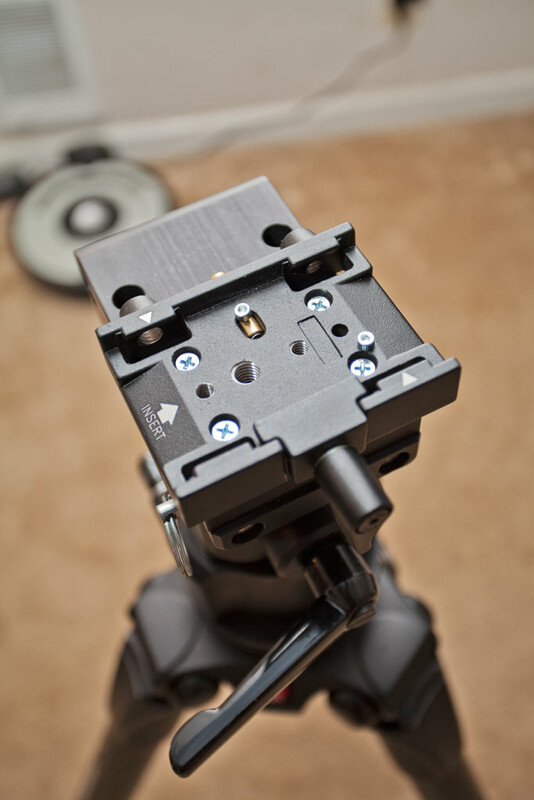 I really only recommend this head to be used on the carriage of your slider, NOT directly on your tripod. Because it’s a threaded mount leveling will be at the mercy of whatever you have it attached to. 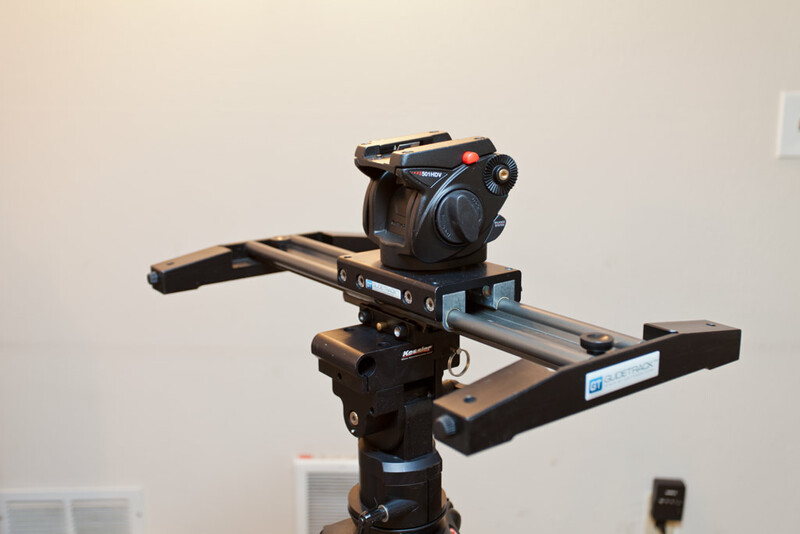 If you mount directly to your tripod and your tripod isn’t level, this head won’t be level – you’ll have to adjust the length of your tripod legs to level everything out. PITA. I have a love/hate relationship with Manfrotto products (mostly hate, to be honest) but this fluid head is pretty great, if you can find it. It’s a little bulkier and heavier than the 701 HDV but supports more weight, which is why I went with it. I thought that maybe I would want to use the Canon 70-200 someday on my slider and that, combined with the Canon 5D2 with the battery grip is a pretty heavy setup. I now know that this is unlikely so if you’re looking for something to mount on the carriage of your slider go with the 701 HDV. That will support your camera/lens weight and is sturdy enough to not have to worry about being too delicate with the storage and transport. 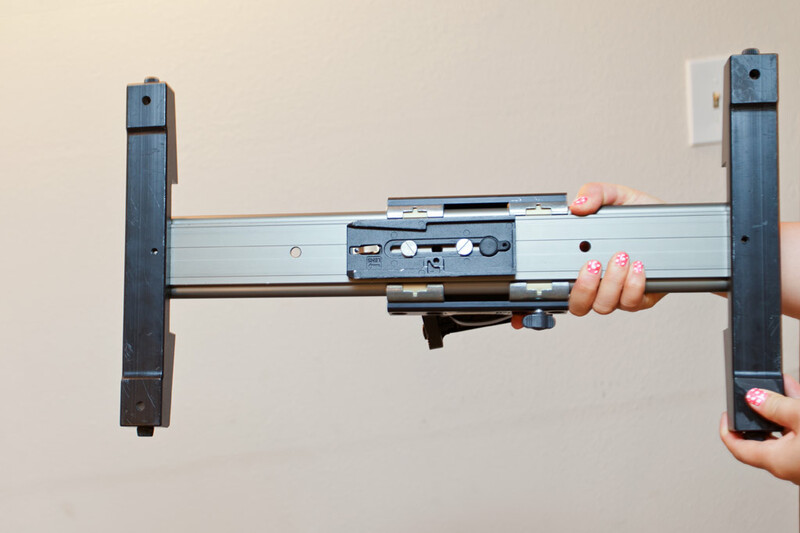 Also, and this is VERY important – it uses the Manfrotto 501PL QR plate. This is very, very, VERY important. Are you paying attention. THIS IS IMPORTANT! Kessler Hercules 2.0 – This is the head I use to connect my slider to my tripod. 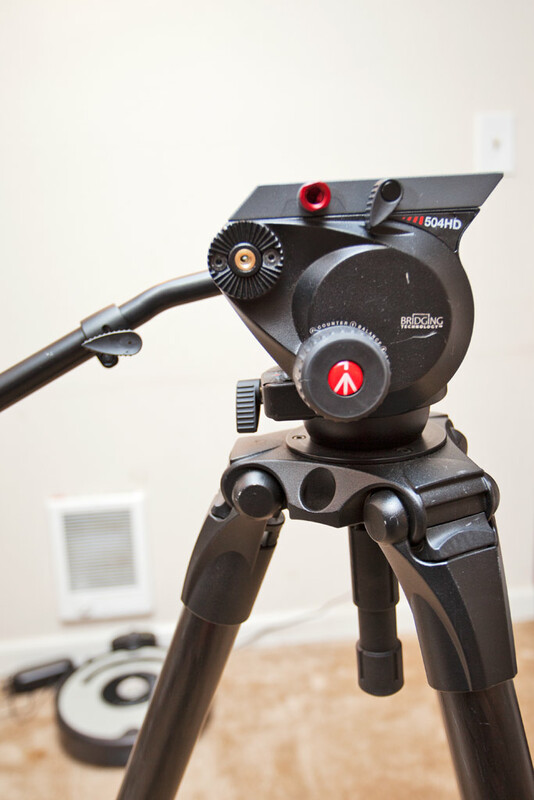 This fluid head and the Manfrotto 504 HD (pictured above, mentioned below) are examples of the half ball mount fluid head. See how the post extends below the head, between the legs of the tripod? This is how you’ll level your fluid head. Just loosen the post, adjust, tighten and you’re ready to go. Much easier than adjusting the legs of your tripod. Here’s a little video to illustrate my point. When I bought this head I was in a very desperate situation (ie: a job within the hour!) (yeah, I know… reeeeaaaal professional!) and was ready to buy whatever Glazer’s, my local camera store, had available. Lucky for me this head was in stock and even luckier, it’s awesome. This is a fixed fluid head – you can lock it down and there’s no give. This is REALLY_IMPORTANT when using a slider. 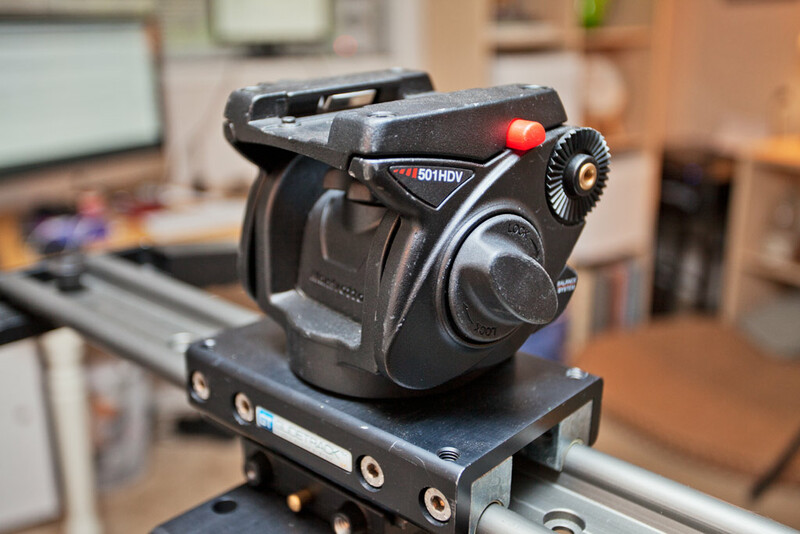 When I first started out I was using the same fluid head for my slider and my crane (the Manfrotto 504 HD) – it worked for awhile which is why I didn’t realize I needed a fixed fluid head for my slider. Soon I started noticing that in all of my slide clips there was a slight and gentle arc-ing. It wasn’t noticeable to anyone but me (I showed it to a few people and they all thought I was crazy) but, believe me, the arc was real and it was there. This is because with a non-fixed fluid head (ie: all the other heads mentioned in this post) it’s impossible to really lock them down. Watch this to see what I’m talking about. Crazy to try and put a slider on that, right? So to reiterate it goes: tripod, Kessler Hercules 2.0 (locked down) fluid head, Glidetrack HD Hybrid slider, Manfrotto 501 HDV, and sliiiiiide. Manfrotto 504 HD (pictured above)- This is aMAAAAAAzing! If I could afford it I’d buy a million of these. Totally worth the three months of Top Ramen for dinner (or maybe you’re independently wealthy?). This is the fluid head that I use this to attach my crane to the tripod. It’s also great for panning (which I try to never do!) and overall general usage. And hey(!) the 501PL QR plate works with this head! If you’re on a budget this is something to build toward. If you’re not using a crane then it’s not strictly necessary but daaaaaaamn (!) it’s a great fluid head. 577 Rapid Connect Adaptor – Get a few of these. And then buy a few more. I’ve had them break on me a few times in the middle of shoots (the tightening mechanism isn’t the best and when it breaks you have springs and pins and weird things exploding all over the place) (remember when I said I have a love/hate relationship with Manfrotto?). It also seems like these are out of stock when I need them. It’s really important to me that all of my gear is compatible so I don’t want to have handfuls of QR plates that only work on one specific head/tripod. That’s why I buy these in bulk when I see they’re available. What size are those 4 little screws on the Hercules 2.0 you attached the 577 Rapid Connect Adaptor with?